Lockers London offers a huge selection of school lockers, steel storage cupboards, hazardous cabinets and changing room equipment. Lockers London have long standing reputation for quality products at very competitive prices together with first class customer service. All our products are available to purchase online and all our prices include FREE carriage to a mainland UK. We are confident that our prices are amongst the most competitive you will find on the internet today! Storage Lockers from Lockers London offer a huge range of metal storage lockers which are designed for almost any environment which needs secure personal storage. 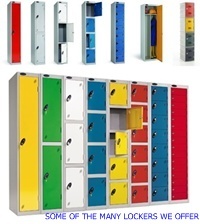 All of our lockers are manufactured within the UK and are suitable for a multitude of applications and environments, from schools, academies, colleges, universities, factories, offices, hospitals, leisure centres, staff rooms the list is endless. 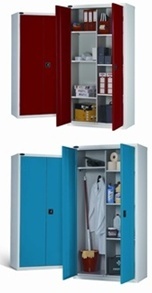 All of our steel storage lockers have been manufactured with a anti-bacterial powder coating designed to stop the growth of harmful bacteria on the body of the metal locker. All our compartment lockers are designed for tough and demanding environments from Lockers for Schools, Education, Manufacturing, and Commercial applications. Within our projects department we are pleased to offer bulk discounts on larger quantities of lockers together with the option of having yourStorage Lockers installed by our experienced engineers throughout London and the UK. Storage Cupboards come in all sorts of shapes and sizes and here at Lockers London you will find a huge selection of Office Cupboards designed to provide secure storage for various office and Industrial applications. For the Office we offer from a standard Metal Office Cupboard with adjustable shelves through to a Cupboard Wardrobe for the storage of clothing and hanging coats etc. We offer a range of Metal Storage Cupboards for both commercial and heavier duty engineering / Industrial applications. Each metal cupboard comes complete with two keys and adjustable shelves. When storage is needed for office consumables we have our Stationery Cupboard. Each one of these stationery cupboards is strong, secure and provides flexible office storage. When price is more important than colour choice, we offer a very competitively price Economy Cupboards. Each economy cupboard offers the same quality and cupboard internal layout as all the other cupboards we sell but it is only available in one colour option. Storage Cabinets offer safe storage for a huge range of chemicals, liquids and specialist equipment. This superb range of storage cabinets and cupboards include: Hazardous & Flammable Storage Cabinets both full height and half height cabinets for the storage of hazardous and flammable liquids or materials within a highly visible cupboard. Chemical Storage Cabinets for the storage of hazardous chemicals or liquids and Toxic Cabinets for the safe and secure storage of toxic chemicals, liquids or materials within a purpose designed and robust constructed Toxic Storage Cabinet. For the storage of acids and alkaline chemicals, we have a specially designed range of Acid Storage Cabinets with Epoxy coated shelves offering a resistant surface to sulphuric acid and more. It's every company's responsibility to have a clearly marked fist aid provision on site. These First Aid / Medical Cabinets offer highly visible storage of a wide range of first aid supplies and medical equipment. Unlike some other manufacturers, the Flammable, Hazardous, Chemical and Acid / Alkaline storage cabinets supplied by Lockers London come with a Smoke / Fire alarm fitted internally. Within our Changing Room / Cloakroom Equipment we offer a comprehensive range of easy to install cloakroom and changing room units with a wide choice of options and accessories, ensuring you will find exactly what you are looking for. All units are available in a choice of six exciting colours to match your cloakroom or changing room interior. With achoice of single and double sided benches with either timber or polymer slats, together with shelves, rails and shoe baskets the options are many. For more information on Ultrabox Plastic Lockers for wet areas, changing rooms, swimming pools and harsh environments please see our BLOG or our ultraboxplasticlocker.co.uk website.